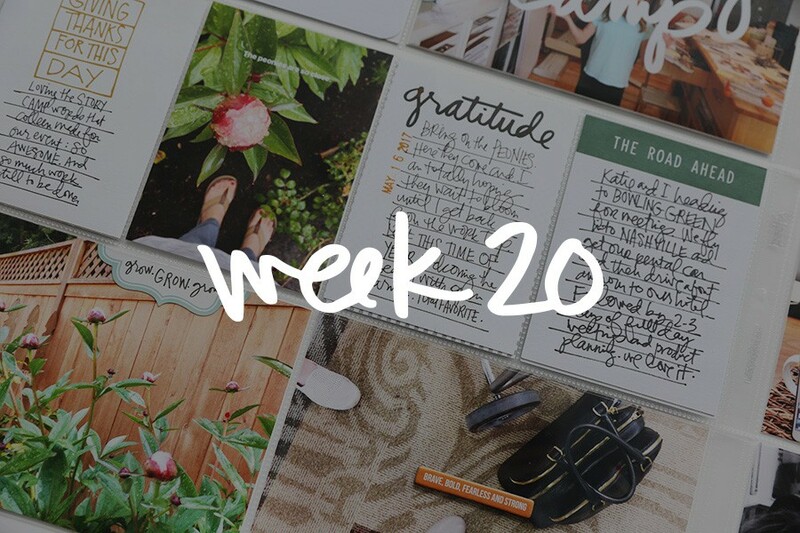 Welcome to Project Life® 2018 | Week Two. Repetition for the win again this week! My repetitive element this week are the Story Cards that are an Add On option for Story Kit™ Subscribers. 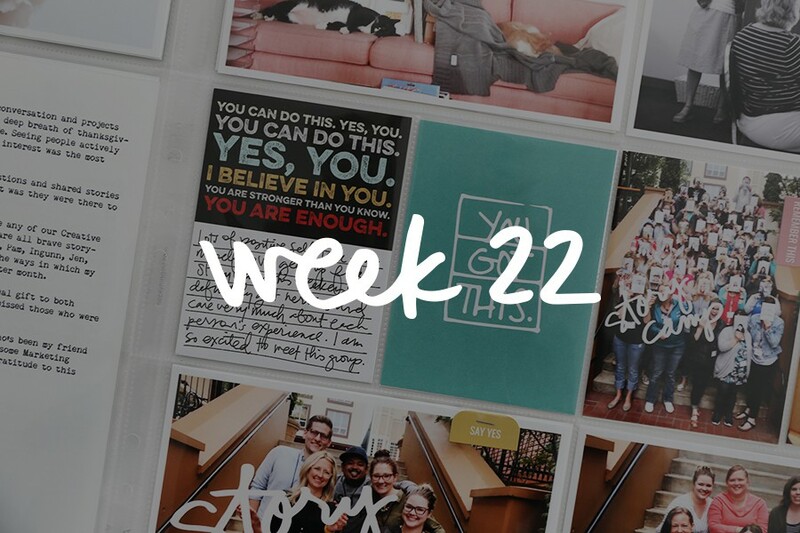 I love cutting them up and using pieces of them on my photos to tell the stories from this week. This week is half home stuff and half vacation time for me and Aaron. We were able to go down to see Dave Matthews again and it was so great - a little bit of a honeymoon for us. White borders on my photos this week for fun - I do this some weeks but not every week. I use my Epson PictureMate PM400 printer - when printing through Aperture and printing with the border is an option (the program I'm using for managing my photos - someday I will switch when it actually stops working - ha). The "Thankful" word is from the Fall Rubber Words set. In addition to the Story Cards I used the gold asterisk chipboard pieces from the Changes Story Kit™. The "today's goals" card is also included in that kit as a paper pad. 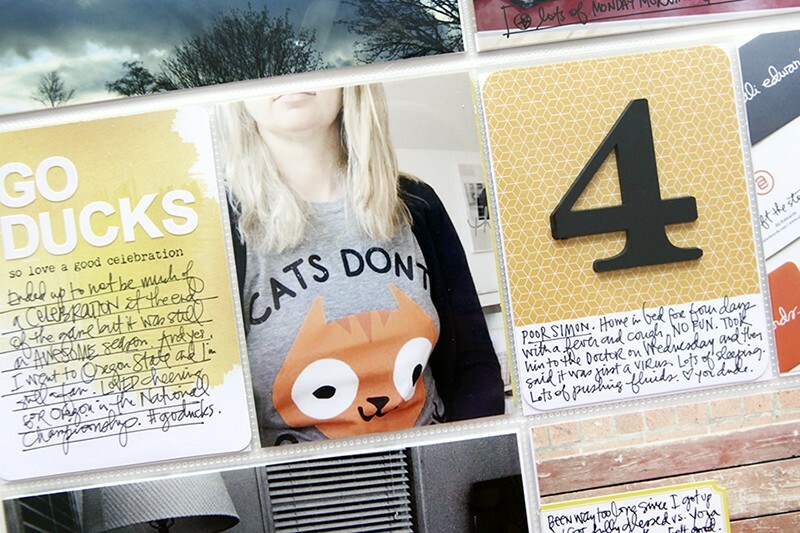 This year I'm planning to incorporate the One Little Word® Inspirational Journal Card Set as title cards into my album. This time I added a portion of one of the Story Cards (these are an Add-On for the Changes Story Stamp™) to hold the date. It's such a simple and easy way to add pieces of the story to my photos. One of the questions people often ask me is about how to include "all" the photos from a trip or other event. My personal choice is to just pick and choose - I have zero desire to include every single photo I take and don't feel the need to create a separate album for some trips (some trips I do - just depends on how I'm feeling). In this case I picked a couple photos of the two of us together, a couple concert photos, and a couple beach photos. For me that was enough to tell the story of this adventure. Keep it simple my friends. Love, love, love these types of posts. Thank you so much for sharing your process. You inspired me to try the white borders. I love how it brings the spread together, but I've never tried it. Thanks for sharing! Cool! I really like the look! I love seeing these pages, and being reminded of super fun ways to use my 'stuff' to get the stories told! ❤️Thank You, for all you do!! The time you save stapling the journal cards to the photos instead of using adhesive is such a revelation for me! Thanks again for sharing the process this week. When you do decide to make a separate album for an event, what size do you make it? I have a few events (baby's first birthday, family wedding trips, etc) I want to make something for, but I'm struggling with the size!